This article was written on July 29th, 2013. The Battledome may be subject to change after the date of publication. July has been another quiet month in terms of updates to the new Battledome. Although this fact does not come as a surprise to most battlers, the Battledome has not been completely dormant. The past month has been highlighted by a meta-game changing weapon, the discovery of the last few Battleground boons, and the second League 97 tournament. As we twiddle our thumbs in anticipation of the next major update to the Battledome, this month's article will also take a closer look at the faerie abilities in their current form - and their impact on the Battledome. -The most obvious fact to know about Stone Foam Finger is that it now serves as a stepping stone between Dr. Sloths Personal Bath Buddy and Skarls Hasty Mace. The price of Stone Foam Finger is much closer to the Bath Buddy than Skarls Hasty Mace, but the power is fairly close to being a midpoint between the Bath Buddy's 14 icons and Skarls Hasty Mace's ~16.5 icon average. The price of Skarls Hasty Mace makes the mace the starting point of quality upper-end Hidden Tower level weaponry, and the comparably lower price of Stone Foam Finger makes the finger the new top-of-the-line for intermediate-level weaponry. You had a nice run, Sloth Duck. -Do not take the above comment as me writing off Sloth Duck. In a way, Stone Foam Finger and Sloth Duck are like the Pirate Captains Cutlass and Kelpbeards Trident of the pre-Anagram era. Faerie Tabard smothers the attacks of Sloth Duck and Kelpbeards Trident, but the other Hidden Tower shields have some difficulty handling these weapons. Meanwhile, Stone Foam Finger and Pirate Captains Cutlass can be mangled by Ghostkershield (and Hubrid Nox Memorial Shield speaking in modern terms), but these two weapons will slide some icons through just about any singular defense. Both Sloth Duck and Stone Foam Finger have a use. -Speaking of Stone Foam Finger's inability to be completely tamed, Physical icon lovers rejoiced upon the discovery of this weapon's effect. Stone Foam Finger now makes it possible to generate bulk Physical icons without using rare & retired items like Asparachucks and Golden Butter Knife. However, Golden Butter Knife will still reign supreme when it comes to punishing 1-Player challengers with Prismatic Mirror. -As a Battledome community, we love to hate Physical icons. Physical icons are ridiculously easy to block, but then again, we have only now been provided with a common 10-icon Physical weapon. Stone Foam Finger's 10 Physical icons will only be completely blocked by full-Physical blockers. Full Physical blockers like Altadorian Swordbreaker and Yooyuball Player Sling are an uncommon sight in the 2-Player arena, mainly because everyone tends to avoid Physical icons like the plague, eliminating the need for such weapons. Now that Stone Foam Finger has crashed onto the scene, let the Swordbreaker meta-game begin. Also, Rusty Pitchfork and Fearsome Gladius are looking much more attractive now. -As a final thought regarding Stone Foam Finger, when will the icon inflation stop? Over the past years, we have witnessed Scarab Ring, then Golden Compass, then Ylanas Blaster, then Sloth Duck, and now Stone Foam Finger continually boost the quality of beginner and intermediate level arms. Meanwhile, the power of upper level weaponry has remained fairly consistent over the years. The gap between pre-Tower and Tower-level weaponry is closing. Will we soon see the gap disappear altogether? Or will the upper-end of battling one day be strengthened as well? Battleground Boons - Opening the Door to Controversy? As of last night, every Battleground faction has now won the biweekly Battleground event at least once. Seeing how the repeat winners have had the same boon selection as before, it is safe to say that we have now gotten a taste of all the boons available to winners. Several of these boons, Doppelganger, Equip ALL THE THINGS, GRRRAAAAHHHHHH, and Strength of Mind, aid the user inside the Battledome. These particular boons open the door to potential controversy. Equip All the Things has room for abuse in two player tournaments. We as a community can ban this boon and all other boons that aid players in battle, but can we really enforce this rule perfectly? Should a battler choose to select this boon during tourney time, he or she could opt to equip nine weapons. If the abuser only uses eight or fewer of these weapons in any given battle, and the opposition is not using Jhudoras Crystal Ball or Everlasting Crystal Apple, then it would be impossible to detect this form of cheating. Some battlers may argue that if the abuser only uses eight or fewer of their equipped weapons, then the abuser is not gaining any sort of advantage; this is untrue. The abuser has the increased power of equipping additional weapons to counter their opponent's set. Set space is a precious commodity in the Battledome; one of the challenges to 2-Player battling is the limit of eight equipped weapons in any given battle. By equipping nine weapons, the abuser eliminates one difficult choice of what weapon to equip and what weapon to bench, greatly enhancing his or her ability to counter the opposition. Compared to Equip All the Things, the other in-battle boons cannot be used quite as maliciously. Grrraaaahhhhhh and Strength of Mind are easy to detect in 2-Player fights for anyone who is at least somewhat competent in calculating damage. Still, these boons are a controversial subject in regards to 1-Player competitions and Defenders of Neopia. None of the in-battle boons are detectable in 1-Player, since only the user can see what is happening, and the two above boons could be the most beneficial for such battles. Assuming HP increase makes a return one day, these two boons could help battlers inflate their records with extra wins that they could not otherwise achieve. 1-Player tournaments would have to rely entirely on an honor system where players agree not to use the in-battle boons. The boon Strength of Mind in particular could devalue the achievement of completing Defenders of Neopia. Like Lens Flare and equivalent abilities, Strength of Mind could make Defenders of Neopia exceptionally easy to complete once it returns. 750 Intelligence is fairly cheap to attain, especially when compared to the costs of training traditional Battledome stats like Strength. With this boon, anyone can land a big hit once per battle. Defenders of Neopia was not designed with the current Battledome in mind. In the old Battledome, completing Defenders of Neopia was a respectable achievement and a stepping stone towards becoming an experienced battler. If Strength of Mind sticks around for the return of Defenders of Neopia, would completing all the missions be a feat at all? In a perfect Neopia, in-battle boons could exist without a problem as all tournament-goers would fight honorably. However, as we all know, the honor system is not perfect. Give players an opportunity to subtly cheat in user-ran tournaments, and you can be sure that someone out there will jump on the opportunity. For this reason, I'd prefer to see in-battle boons phased out in favor of out-of-battle boons. It is also worth noting that the Brute Squad is thought of as having the least desirable boons, despite many of the boons being Battledome related. Players typically prefer boons that offer a slight Neopoint advantage for the week. This preference means that perhaps the in-battle boons could disappear and be replaced without much outcry at all. The second League 97 tournament is now in the books. Twenty-three participants competed for the crown in the July event, and user 2ouche persevered through the finals to take the championship. Over the course of the second event, over 200 2-Player battles were fought. Twenty-nine different battlers have now logged a L97 tournament battle! The third L97 event, and the first to be hosted on iDB, is now just around the corner! Beginning August 2nd, participants will face off in the grueling Summer Scorcher. Unlike the previous two events, there will be no pool play. Instead, all participants will duke it out in double elimination play! Click here for details. The Summer Scorcher will be the final L97 event of the summer, but another event will be slated to take place in October. Now that iDB is the official home of L97 events, we hope to host an array of material to promote the league. I highly encourage anyone interested in participating in the future to prepare a pet for the October event. With the low stats of 97HP, 20 Strength, and 35 Defense, cheap dubloon training is possible until the final stint of the training. L97 is a cheap, fun way to get immersed in the 2-Player community! For those who are feeling down about the current state of the Battledome, I highly suggest trying the L97 format. The Battledome can be quite glitchy, but despite the glitches, the L97 format is a fantastic brain exercise. Competitive sets in this format are not like the cookie cutter sets in other formats, and a competitive L97 set can be built on a much lower budget than traditional 2-Player battling requires! Best of all, the L97 community provides a sense of unity for those involved. Learn to think outside the box, meet new people, and have loads of fun in the process! While we all want the new Battledome to be improved, we have a great new format right here, right now! Don't be shy, give it a try! The rest of this month's article will examine the new faerie abilities, their impact on the Battledome, and how they could be tweaked to promote a more strategic game. It is no secret that experienced battlers are not particularly pleased with the effects of the new abilities. Although abilities like Lens Flare make daily farming mindlessly easy, these abilities severely hinder strategy. User-ran 2-Player tournaments, including League 97, are all putting restrictions on these new abilities as a result. Some of the new faerie abilities woes can be alleviated by the hopeful eventual return of stances and species attacks, but ultimately tweaks must be made to the new faerie abilities to promote the most strategically-enriching game possible. Perhaps the best way to begin examining the faerie abilities is to compare the new abilities to the old abilities. By no means was the old faerie ability system perfect, but it nonetheless provided for a competitive game. The primary criticism of the old system was the plethora of useless or near-useless abilities which greatly outnumbered the useful abilities. Although many of the old abilities were impractical for serious use, remember that the old system had over 50 abilities. The new faerie ability system contains only 30 faerie abilities, many of which are still not particularly good. The biggest criticisms of the new system are that the most popular abilities are all overpowered, and that the weaker abilities are pointless, eliminating the goal of a tier system. The entire point of the tier system should be to pose battlers with a difficult situation - three competitive abilities, but you may only have one. As of now, the tier system does not achieve this goal. In almost every tier, one ability wins the popularity contest by a landslide; that one ability is simply far more competitive than the rest. Compared to the tier system criticism, the criticism of the new faerie abilities being overpowered is far more opinionated; it deserves a deeper look. Let's first examine the marquee abilities from both the old system and the new system. Let's focus on the effects, not the names. It is difficult to compare the two systems when the new faerie abilities are heavily glitched, but based on what we know and what we can speculate, it is pretty easy to see that the new abilities are far more powerful than the old abilities. Two other significant changes are important for understanding the difference between new and old. The first important change to note is the removal of the power bar. In the old Battledome, the power bar placed a limit on faerie ability usage for both players and challengers. The power bar meant that users had to use faerie abilities sparingly and supplement them with stances and species attacks. For challengers, the power bar meant that there would be an end to their unrestricted faerie ability use. 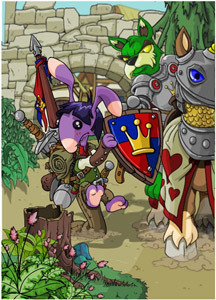 Few challengers in the old Battledome had useful abilities like Restore, Burrow, Sink, and Drain Life, but the ones that did would eventually lose the power to spam such abilities. The power bar served as a balancing mechanism for these challengers. In the new Battledome, no such power limitation exists. Challengers are now free to spam abilities with no end in sight, aggravating the Battledome community. The other change of note is the implementation of Once Per Day (OPD) abilities. OPD abilities have no place in the Battledome. In the typical day, a player might fight many battles or no battles at all, but very rarely will a player fight only a single battle. If players choose to battle in quantity on days that they battle, why would any of them choose a OPD ability from a tier where non-OPD abilities are available for choosing? OPD abilities completely defy the concept of Battledome time. In the Battledome, there is no true timer. Battles are measured in number of moves or turns; pace of play does not truly matter. Once Per Day abilities place a timer that does not otherwise exist in the Battledome. A Once Per Day limitation simply does not make sense in a game that does not otherwise keep a clock. Can the challenger faerie abilities be limited in some way, or can both players and challengers be subject to a power bar once more? Certainly. Can OPD abilities be replaced with more fitting "regular" abilities? Of course. Both of these points have been discussed and suggested endlessly at this point in the Beta process, so let's take a deeper look at some of the ability effects themselves. Neither new faerie abilities nor anything the Battledome has even seen before can match the power of Lens Flare. Lens Flare is typically the ability that is the most recognizable in a group of similar faerie abilities due to being the mostly easily attainable of the lot, but Warlocks Rage and the other abilities currently behaving in the exact same manner as Lens Flare help compound the problem. Some battlers have compared Lens Flare and its equivalents to Thyoras Tear. This is a grave understatement. Thyoras Tear does nothing more than stop damage for a turn. It cannot prevent a freeze. It cannot stop the opposition from healing. It cannot stop the opposition from defending. It cannot prevent the opposition from benefitting from any action other than attacking. The power of Thyoras Tear is puny compared to Lens Flare. Lens Flare disables everything except for the opposition's ability selection. The only countermeasure available for Lens Flare is an opposing Lens Flare. In 2-Player, failure to use Lens Flare or an equivalent against an opposing Lens Flare will result in almost certain death. In 1-Player, Lens Flare and the equivalent abilities make battling mind-numbingly easy, that is if the challengers are not spamming Lens Flare themselves. With Lens Flare remaining the way it is, the Battledome revolves around... Lens Flare. As a result, Lens Flare and all equivalent abilities are being banned in user-ran tournaments everywhere. Lens Flare is the equivalent of bringing a nuke to a knife fight; everything except the nuke becomes pretty irrelevant. The only solution to improve the Battledome in regards to Lens Flare is to nerf it. Also, the duplicate abilities can be altered to more unique effects. My recommendation would be to reduce Lens Flare to only disarming the first slot weapon. By only disarming one weapon, players can prioritize their weapon selections as well as eliminate the need to use Lens Flare for the sole purpose of canceling out an opposing Lens Flare in 2-Player battles. Both of these facts would improve the overall level of strategy in all fights. Lens Flare. Beginner and pro alike, we are all using it right now. Lens Flare makes life easy when it comes to farming Codestones and Battleground wins. But deep down, we all know that it just isn't right for things to be this easy. Although none of the other abilities can compare to Lens Flare and friends, Reflect in its own right is very powerful. This level 400 ability reflects 2/3rd of all damage taken back at the opponent. I once heard a player suggest that a Thyoras Tear-type weapon that reflected instead of blocking would be a good idea. This suggestion was utterly insane, and the ability Reflect is two-thirds as insane as this idea. Imagine two players with equally strong sets. Now imagine that both of these players select two offensive weapons of equal strength. One player uses Reflect; the other does not. Reflect will cut down the second players attack to one-third its original strength, or one-third the strength of the first player's attack. Reflect will also send the other two-thirds of the second player's attack back at the second player. Remember that the first player also used equally strong weapons. The first player has their attack topped off with two-thirds of the opposing attack. The second player only has one-third of their attack reaching the opposition's hitpoints. Between the reflection and the first player's own attack, the first player has inflicted five times the amount of damage as the second player. Unlike standard reflectors, the Reflect ability is not icon specific. If Reflect is used and the opponent attacks, it will reflect a significant amount of the opponent's attack. Very little skill or strategy is involved in using Reflect. Comparatively, typical reflectors are difficult to use; oftentimes reflectors can be huge gambles. The reason reflectors are so risky is the fact that they only block specific icon types. If the opposition does not use the specific icon types on the turn the reflector is used, the reflector is virtually useless. Reflect should not be related to reflectors because it is no gamble. Reflect as it is now is no risk-huge reward. Ignoring ability counters, the only way to avoid the Reflect ability would be to not attack at all on the turn the opposition uses the Reflect ability. Since the level 400 tier is rather bland, my recommendation for the tier would be to make three toned down Reflect clones. Instead of reflecting all damage, these three reflection abilities would only reflect one, maybe two icon types. The three abilities would all reflect the same percentage of the given icon types, but each ability's icon scheme would be different. These abilities would be respectably powerful still, but they would need to be more strategically implemented. Players could choose their reflection ability based on their needs, a particular reflect ability could help reinforce a soft spot in their set's defenses. Like the other abilities above, Rejuvenate is far too powerful. This level 300 ability will provide a full heal, so long that the user have at least 5% of his or her HP remaining when the ability is used. Healing is a valuable commodity in the Battledome; top-shelf healing items are often some of the most expensive items on battlers' shopping lists. In the old Battledome, the top healing abilities only restored one-third of lost HP. Not to be confused with a one-third heal, these old abilities only healed one-third of missing HP. Healing abilities in the new Battledome can certainly be better than their old Battledome counterparts to make them more competitive when compared to other new Battledome abilities, but a full heal is going overboard. A true full healer like Leaded Elemental Vial costs millions; even a single use full healer like Jade Elixir comes at a few thousand Neopoints, just for one heal. A full heal is meant to be one of the valuable commodities in this game. Like many of the new faerie abilities, Rejuvenate dilutes the value of the powerful effects available in the dome. Effects like full heals become less special when herculean abilities are available left and right. My recommendation for Rejuvenate would be to reduce the ability down to a one-third heal. As it is now, no one in the right state of mind would even consider the other two abilities in the level 300 tier. As a side note, the Healing Fire ability in the same tier deserves an upgrade. A typical level 300 pet does not have much need for a 25HP heal. I have mentioned already that Once Per Day abilities should be replaced. Battlers are simply uninterested in abilities that can be used so sparingly. Throw Pillows, a OPD ability, currently behaves like Lens Flare, but it has acted as a 100% freezer in the past. Like Rejuvenate, Throw Pillows should not offer 100% accuracy. This accuracy is immensely powerful, and despite the power, Throw Pillows does not add much interesting depth to the Battledome. Oftentimes in 2-Player battles, freezers cancel each other out. In many 2-Player battles, a freezer must be used to cancel out the opposing freezer to avoid a following turn KO. As a result, freezers are often banned from play to eliminate such a vanilla turn of play. In some cases, players can hold off on freezing each other because they are not at risk of instant death on the first turn should they not freeze. These "late freeze" battles will transform into first turn freeze battles as well should a 100% freeze ability coexist to compliment 100% freeze weapons. Players will be forced to use one freezer after another to stay alive. Should one battler choose not to use one of their freezers as soon as possible, that battler will be susceptible to two straight turns of freezing from the opposition, allowing the opposition to inflict a tremendous amount of damage, much more than what could be inflicted from only one freeze. Almost no pet build could withstand two straight turns of freeze-bombing in league play, making an immediate freeze necessary. The abilities Fiery Gaze and Diamond Dust were the perfect examples of high risk-high reward in the old Battledome. These abilities took a tremendous amount of power; players had to sacrifice power that could be used for another powerful ability. Despite this high cost, these abilities would only freeze about one-sixth of the time. Fiery Gaze and Diamond Dust were reserved for moments of desperation. No such risk exists with Throw Pillows. Combined with the other super-powered abilities, Throw Pillows is just another one of the many "free win" buttons in the new Battledome. Freeze abilities would be best rendered as they were in the old Battledome - very risky, but with huge potential reward. In the old Battledome, Quench served as a great sidekick ability. Quench was nowhere near as appealing as Burrow and Sink, but it was incredibly useful due to its low power cost. Even Steam Shield, which took more power, was used on rare occasions. These abilities, which only defended a single icon type, are nowhere to be found in the new Battledome. The closest thing that might resemble these abilities would be the level 100 tier of abilities - Shroud, Burrow, and Float. This tier of abilities is heavily glitched at the moment, but we can speculate that each of these abilities offer heavy protection against three icon types. The level 100 tier is the perfect example of balanced faerie abilities. Abilities like Quench in the old Battledome and Burrow/Shroud/Float in the new Battledome should serve as model abilities. These abilities have fantastic potential, but they are not automatic win buttons. The new Battledome seems to have lost sight of modesty; everything now boasts incredible power. However, the Battledome was not designed around Lens Flare. It was designed around working-man abilities like Quench, Burrow, and Sink. Ultimately, I believe abilities should aid weapons, abilities should not run the show, making weapons into nothing more than fancy sticks and stones. The greatest joy of battling comes from the strategy involved and the success that comes from a well-executed strategy. The greatest reason for nerfing many of the new abilities should be the fact that Lens Flare and others rob any sense of mental gratification from players. Zero risk, huge reward abilities offer nothing in the way of mental gratification; such abilities may be a general reflection on the never-ending sense of entitlement in modern society. However, the real rewards come from difficult challenges, not easy ones. 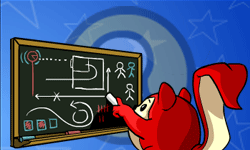 An ideal Battledome is a Battledome that forces players to think before they act. -It was recently discovered during the course of a L97 fight that Superior Reflection Shield's effect changed at some point. The change has made this weapon go from an afterthought to a weapon worth serious consideration. Check it out. -The iDB Top Rated Weapons page is now in the not so distant future. In order for a weapon to make the page, it must have two or more reviews. This requirement is to ensure that the list is not subject to any one rater's opinion, but rather the entire iDB team. With a plethora of new raters joining the ranks this month, expect to see weapon profiles fill up soon! This page was last updated on August 1, 2013.